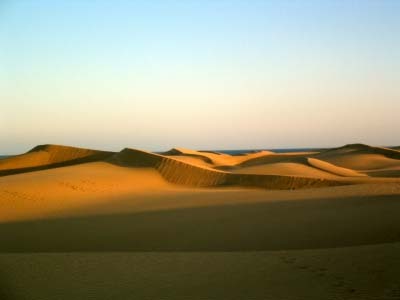 Maspalomas, guide to the Gran Canaria holiday resort of Maspalomas. Maspalomas - The oldest and biggest tourist resort on Gran Canaria, Maspalomas has hundreds of hotels and apartment blocks, miles of sandy beaches and dunes, a wide range of bars, discos and restaurants and a vibrant and lively nightlife. Maspalomas History: Located in the municipal area of San Bartolomé de Tirajana, Maspalomas possibly got its name from a Mallorcan soldier named Rodrigo Mas de Palomar an original settler on Gran Canaria. There is little of historical or cultural interest to be found in Maspalomas so if this is your thing then head elsewhere, there is however the lighthouse El Faro de Maspalomas which is 68 metres in height and located at the southern point of the resort where miles of beaches and sand dunes are part of a Nature Reserve. Work was begun on the lighthouse in about 1861 and it was designed by one Juan de León Castillo. There is plenty to see and do in and around Maspalomas including Aqualand, the largest water park in the Canary Islands, with plenty of slides, pools and aquatic fun (book tickets below), there is also a large amusement park called Holiday World which is particularly popular with the younger visitors to Maspalomas. The subtropical oasis the Palmitos Park is also very popular with numerous species of bird on show (book tickets below), also in nearby San Augustín you will find the Wild West theme park Sioux City another big attraction. The Arteara Camel Park is also a popular location (book tickets below). The resort is very big with water sports enthusiasts and there are plenty of facilities to supply the demand, surfers and windsurfers make up the bulk of the sporting set although the deep-sea fishing is also in demand. Maspalomas also has a fine golf course, again the biggest on Gran Canaria and the area attracts golfers from all over the world, the fine weather makes it possible to play golf here all year round. Nearby you will find Playa del Inglés where there is a huge shopping centre called the Yumbo Centrum and it is here that thousands of visitors get a bit of retail therapy while taking a break from the constant sunshine. Maspalomas Hotels - Maspalomas Accommodation: There are hundreds of hotels and apartment complexes in and around Maspalomas and you should have no problem finding something suitable for your stay, most of the major tour operators feature a good selection of Maspalomas hotels and holidays and as the selection is wide and varied, it would not be correct for us to recommend specific choices here. You can book Maspalomas hotels at the cheapest rates by using the search box on the right. Find Maspalomas holiday rental villas and apartments lower down this page. Maspalomas is located at the southern end of Gran Canaria in the sunny Canary Islands, it is about 30 kilometres from the airport at Las Palmas. Oasis Maspalomas. Maspalomas airport driving distances: Las Palmas airport to Maspalomas is a driving distance of 34 kilometres (21 miles).